We stepped out of pilsner month on Thursday but before we leave it too far in our rearview mirror we should take one final look at its legacy. 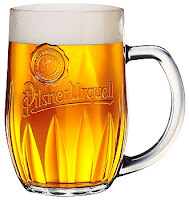 The impact of pilsner beer cannot be understated; it is still being felt today, I posit that our current craft beer revolution owes a huge debt of gratitude to pilsner beer. First a bit of history, pilsner gets its name from Plzen, Czech Republic, a small town in the Bohemia region. Plzen had a few advantages in creating pilsner beer. It has ridiculously soft water compliments of the limestone, a distinct style of noble hops, Saaz, located just down the road, fertile land for growing barley, and caves that will keep things cool. The brewing community was also properly motivated. A few years prior vats of beer had to be dumped because of their horrible taste. Quite a scandal for the local brewing scene so there was an impetus to change it up and prove some brewing competence in Plzen. What they introduced, in 1842, (with an assist of a smuggled Bavarian yeast strain) was a beer unlike anything scene before. A crystal clear, golden colored, high carbonated, white fluffy headed wonder. A beautiful filtered lager built for refreshment. It was a smash hit…and that may have been the end of the story, but here is where the pilsner story gets a whole lot more interesting. In my view the most fascinating thing about pilsner isn't the beer itself but its popularity explosion around the world. If pilsner had been introduced 50 years, maybe even 30 years earlier it may not have risen to the heights it did, it may have stayed a regional novelty. The timing of pilsner's arrival could not have been better. It was to be the beneficiary of technological, industrial, and social convergence. By 1842 the industrial revolution was in full force in the German states and railways were rapidly connecting cities and all points between. In addition communication channels were also improving, (newspapers, telegraphs) News of this new beer spread across central Europe pretty quickly. With reliable transportation it became possible to ship it and once modern refrigeration arrived on the scene it became possible to store it for longer periods of time. With a beer as novel as pilsner once it showed up on the scene it was soon copycatted. The 1840s were also a period of upheaval in central Europe, notably 1848, where revolutions spurred massive immigration to the United States. German immigration brought along with it a strong brewing culture and a thirstiness for pilsner beer. German brewers quickly established brewing strongholds throughout the United States but most prevalent in the midwest in places like Milwaukee and St. Louis. The seeds for pilsner's rise and decline would be sown here. Americans were thirsty for this brew and it caught on quick. The Germans in Europe were also doing their part to spread the pilsner word. Once the Prussians brought about unification they then turned colonization in Africa and parts of Asia. Where the Germans went so did their beer. Since pilsner didn't travel well it became necessary to brew it in the colonies. Part of why pilsner caught on like wildfire was that it was refreshing and great at quenching thirst but still light on the palette. While it is a lager and tastes been when chilled with the advent and proliferation of modern refrigeration these issues became moot. So what happened? How did a beer that had reached stratospheric heights in popularity end up with such a mediocre reputation. It is interesting to note that reputation only really holds true here in the United States, pilsner's reputation in other places is not as poor. In fact it soon had inspired a variety of responses and competitors like Kölsch, Kristallweizen, and Belgium tripel, to name a few. In the States though we had Prohibition, over a decade of poorly thought out temperance that thoroughly devastated the American brewing industry. The most aggressive of those survivors were soon national then global in scope. Making money became the most important factor, not necessarily brewing the best product, but brewing a product that will fly off the shelf the fastest. Once that became the focus pilsner changed to pilsner-like and it's reputation declined accordingly. It was this lack of creativity and homogenization of beer that helped fuel people's desire to drink and try other brews which has led to our current burgeoning craft brewing revolution. It should be no surprise then that it is in this arena where pilsner as a style has started to gain its credibility back as a delicious and refreshing beer that when brewed with care and inspiration shows us how it managed to soar to the most popular beer in the world. Port City revealed their new Pils, the "Downright" last night. I have to say that they did not disappoint, another great beer from Port City.